My grandfather never served in the military, yet for some reason an American flag has been place besides his gravestone honoring him at a World War II veteran. At first, I wondered if it should be taken away, but who do you notify about something like that? Plus, I just couldn’t make a call like that. I couldn’t bring myself to say, “You mistakenly put a flag by my grandfather’s grave, but he never served in the military.” While my grandfather never wore army boots or rode in the Calvary or fixed an army tank, he loved his country and he served in World War II…just in a different way. See, my grandfather and his brother tried to enlist at a locally, but were rejected due to their flat feet. Undaunted, they drove to Philadelphia, thinking they might slip by the recruiters in a bigger city. Alas, their giant, flat feet sold them out. I know that throughout his entire life my grandfather felt a sense of shame believing that he wasn’t “man enough” to be in the military. But who knows what would have happened if he had served? Would he have been killed in the Battle of the Bulge like my grandmother’s first husband, Luke? Or did God have another use for my grandfather’s talents? My grandfather was a craftsman. If anything was broken, he could fix it–and he took great delight IN fixing it. Eventually, he became a mechanic for a large sewing factory, teaching woman how to sew and fixing the machines when they broke. He invented devices, that if he had thought to patent, would’ve made him a very rich man in his later years. 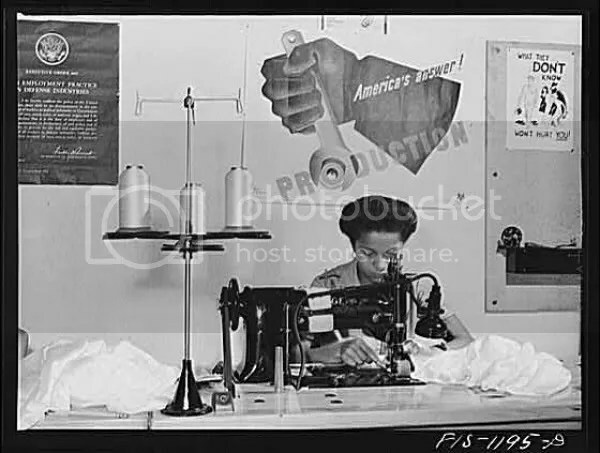 While the factory started out making bras and slips, as the war raged, they started to craft parachutes and American flags. In some way, this was a salve to my grandfather’s broken spirit. Who knows how many more lives were spared because of the parachutes my grandfather and “his girls” crafted? Like I said, my grandfather, Edwin Landis, never served in the military. But he used the gifts given to him by God to protect the military. Though it may seem inappropriate to some, I think that American flag is properly placed because if there was ever a man who did something for his country, it was my grandfather. He may never have his name memorialized in a tribute concert or a plaque, but I’d like to honor his contribution to freedom right here and right now. You did a good job, Poppy, and I’m proud of you! Amy, one thing I’ve learned over the years….serving our country doesn’t always mean wearing a uniform, shooting a gun, or killing people…..your grandfather sounds like a patriot indeed!